The Coalition of Clean Air Advocates signed the petition addressed to President Noynoy Aquino to strictly enforce Republic Act 8749 or the National Motor Vehicle Inspection and Maintenance Program. This is in response to providing a cleaner air in Metro Manila. Eighty (80%) percent of the air pollution in NCR is caused by unabated motor vehicle emissions. (L-R) CCAA Chairman Atty. 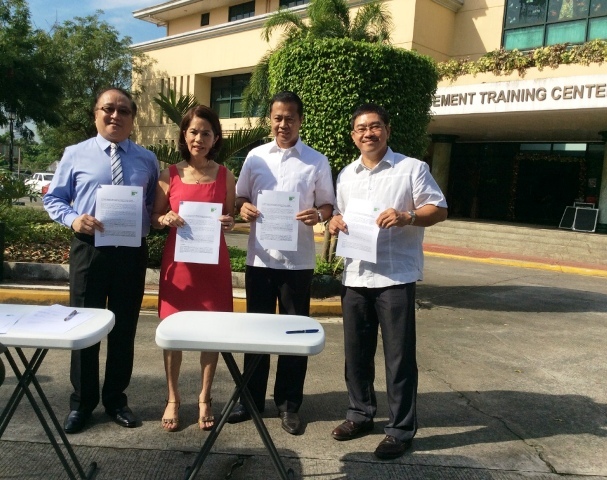 Leo Olarte, ABS-CBN Lingkod Kapamilya Foundation Chairperson Gina Lopez, DENR-EMB Director Jonas Leones and CCAA President Herminio Buerano, Jr. signed the petition addressed to Pres. Aquino to strictly enforce R.A. 8749 or the requirement to register and maintain the vehicle to assuage smoke belching. The support of Pres. Aquino shall enable the coalition to reduce the air pollution level from unacceptable quality level of 136 ug/Ncm to 90 by December 2015. The Clean Air Act was enacted in 1999 after ABS-CBN Lingkod Kapamilya Foundation, Inc.’s Bantay Kalikasan gathered 5 million signatures to pass this bill into law. In celebration of Clean Air month, a total of 500 emission testing centers nationwide will provide the service for free only for today. Let the white doves fly! (L-R) Representatives from Miss Global Philippines, CCAA Chairman Atty. Leo Olarte, MD., DENR Secretary Ramon Paje, ABS-CBN Lingkod Kapamilya Foundation, Inc. Chairperson Gina Lopez, DENR-EMB Director Jonas Leones and CCAA President Herminio Buerano, Jr. unleashed white doves as symbol for the appeal to have cleaner air quality in Metro Manila.